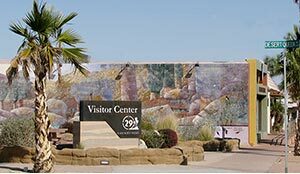 The 29 Palms Visitor Center & Art Gallery welcomes visitors from around the globe each year. Whether you are one of more than 3 million annual visitors to Joshua Tree National Park, or are exploring the new Mojave Trails National Monument, or are heading to the Marine Corps Air Ground Combat Center, or are just arriving in our desert community, or maybe just passing through … we are happy to answer your questions and help to make your desert stay an enjoyable and safe experience. Our desert community supports sustainability! 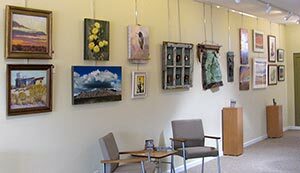 Our visitor center is open daily from 8:30 a.m. to 5:30 p.m. (except major holidays) and offers park maps, brochures, lodging and local services information, free Internet computer stations, gifts, souvenirs, local books, T-shirts, hats, art cards and postcards, a community art gallery, an electric car charging station, business referrals, and a friendly staff to provide advice and information. 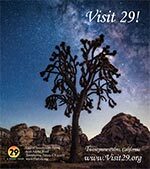 The Visit29.org website is sponsored by the City of Twentynine Palms Tourism Business Improvement District (TBID), managed by a TBID Advisory Board appointed by the City Council, and supported by funds from the lodging properties in Twentynine Palms, California. Hours: Open daily 8:30 a.m. – 5:30 p.m.